Tuesday evening after returning form the IDP camp, I heard from our hospital/clinic team that they had seen a baby that was profoundly dehydrated and malnourished to the point that his skin was sloughing off. They had spent hours resuscitating him and when our team had to leave they hoped he would survive the night, that evening we attempted to make contact with a pediatric hospital or the USS Comfort but all of our efforts failed as we could not get through to anybody. It had occurred to me that a dear friend of mine had just arrived in the country with Helimission, an international organization that flies helicopters to rescue people; they fly in food and do med-a-vacs in developing countries. I sent him an e-mail, and within a few hours we heard back that they would fly out first thing in the morning to pick up our baby. The team arrived shortly before the helicopter only to discover that the baby had died during the night. The helicopter had flown in for no reason… so they thought. You see every day when the staff (our team) arrives there are about 50 people there in the waiting room. As the staff walked through the waiting area they quickly identified a very ill 2-month old baby girl. The baby was taken in immediately and it was determined that she was so dehydrated that she was on the verge of death and you know where this is going… there was a helicopter waiting for her. Our base leader here accompanied the baby on the helicopter to the University Of Miami Mobile Hospital at the Port-Au-Prince airport where a trauma team converged on her and stabilized her. He said that there where 20 photographers and news agencies there filming the whole thing. So if you were watching the world news on Wednesday evening and saw a baby being rushed into the UM mobile emergency room from Haiti is was probably our little girl. I was at an IDP camp today with my friend Nate who is also a PA at Unity Hospital when the word arrived that the baby had died… it was like a knife going through my heart when I heard it… I never even saw the baby, I just spent a few hours searching the web and trying to make phone calls on his behalf. But I think it was just the weight of one more thing, surrounded by thousands of hurting people with needs too great to meet. Thursday, Helimisson will do two more med-a-vacs for us, the first is a lady I saw yesterday who arm was completely broken above and below the elbow. When I first saw her she walked into our bus carrying her baby in the other arm with other flopping in two places. The second is a one year old boy who has a very loud hear murmur and is in heart failure who is decompensating. He has never been seen by a doctor. Thanks to Ben and the Helimission crew whose US administrative office is located in Lima NY. Today, I feel like we were better prepared emotionally for what we saw at the IDP camp. I think knowing what to expect helped… don’t get me wrong I was fighting back the tears about 4 times watching children, adults and elders limp into our bus… wondering if anything was really making a difference as you were sending them back out into the fabricated houses with little or no food and were the filth is just beginning as there are no latrines. We saw a lot of sick kids with pneumonia and today that makes me feel better when you know you are making a difference in their lives with a shot of antibiotics and some to go… at least this time. The tears for me is not from seeing them in physical pain, it is not from the gapping wounds crawling with flies, or one more kid with diarrhea and we only can give each one 2 days worth of oral dehydration because it is all we have. It is about the profound emotional trauma that these people have experienced, as I said in a prior e-mail it is watching them scream and break down sobbing when we do something that should only hurt a little, knowing they are really screaming because of the trauma of the past two weeks. It is about meeting the parents who loss 5 kids, the wives who have not seen their husbands since the quake and kids who show up at the mobile clinic alone… because they are. 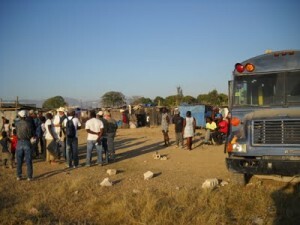 There is in Haiti what I call a “Great Disconnect”, it is the gap between the hundred of millions of dollars of aid that has been brought to Haiti that I hear is sitting at the airport and big distribution center and the people who need it. 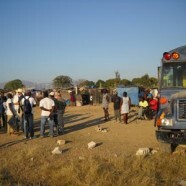 We have gone to two IDP camps this week and we were the first to show up with any aid or support at either one. From both of these camps you can see the US Embassy so it is hard to imagine what is happening at camps that are further out. I say further out as have left the center of the city which was the epicenter of the quake, it is in ruins and will take years to rebuild it. It is also the disconnect between large aid agencies and the front line worker like us who are doing a good portion of the work, we don’t even have a way to contact them…. 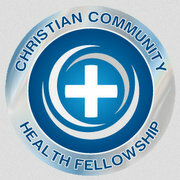 It still amazes me that two PAs (myself and Nate) from Rochester NY, a family med doc from Warsaw (Dan Zerbee) , a former missionary nurse from Brazil (Ken, who starts work next week at my hospital) and my 17 year old son (Tim) were able to connect with a team of 7 nurses from Indiana and make a difference, albeit a drop in the bucket in people’s lives. With our best efforts some have and will continue to die but many will live. So even though it is painful in so many ways, we are all glad we are here and all hope to return in the months to come.